Every gardener will tell you: nothing beats the thrill of pushing a seed into the soil and then, days or weeks later, seeing a tiny green shoot on the surface of your garden! Even if you usually buy plants or start your seeds in the Bio Dome, consider direct-sowing one or two varieties into the garden this spring. All you need is a packet of seeds . . . and if you’re like us, there are always a few extras of those! Choose big seeds. It sounds silly, but big seeds are easier to handle and often to grow, too. If you want to try a veggie, look no further than beans or corn. For flowers, the tried-and-true “never-fails” include zinnia, sunflower, and marigold. Vines of the legume family work well too, such as morning glory. Prepare the soil. The books will tell you to do this in fall, and yes, we all should have, but never mind! At a minimum, turn over the soil to about 6 inches deep, raking out all the rocks and lumps and removing any weeds and roots. Once you’ve done this, try to avoid walking on your newly-turned soil. You don’t want to pack it down too hard. 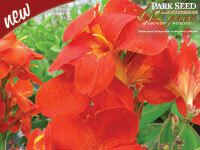 Follow the instructions on the seed packet for sowing your seeds. 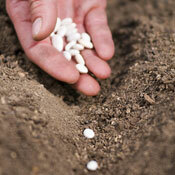 Most seeds like to be sown about 3 times their thickness deep in the soil. Some need to sit on top, because they won’t sprout without light. If you are planting a row of seeds, such as for a veggie patch, create a straight furrow and tip the seeds into it as evenly as you can, rather than trying to drop each one in. If you are planting them hole-by-hole, put 2 seeds in each hole. Seeds are cheap, and using 2 seeds per hole will increase your chances of getting a nice full planting. Water the newly planted seeds gently, and keep an eye on the soil. It should remain moist (not wet) and never dry out completely. When the seedlings are about 3 to 4 inches high, thin them. This means that if two seedlings have emerged from one hole, or if your vegetable seedlings are too close together, you must harden your heart and gently pull up one or more of the seedlings. If you don’t, they will grow spindly and stunted, or perhaps die anyway. Take pictures every step of the way, so you can remember your direct sowing adventure. You’ll be surprised when you look back at the snapshots next winter! 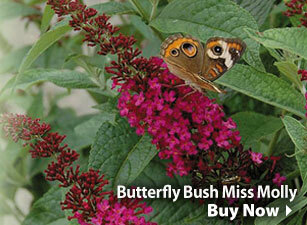 When it comes to our gardens, sometimes it seems Mother Nature has a wicked sense of humor. All of our careful planning and strategizing can go for naught when a late frost, early heat wave, extended dry spell, or torrential rainy season strikes. What can we do to protect the plants we’ve grown so lovingly? The best solution is, of course, the right plant in the right place, but as gardeners, we rebel against that! Why shouldn’t we grow what we like – within reason, of course! – in our own gardens? We are certainly willing to put in the work. So how can we be more successful when the weather fails to cooperate? Before you fill your container with potting soil, place Aqua Pads in the bottom of the container. These sheets soak up a remarkable amount of water, then gently release it as plant roots need it. Using them can reduce watering frequency by an astonishing 85%. When you fill the container, use Soil Moist Plus or shake AquaRocks into the potting mix. Both of these absorb huge quantities of water for release later, as the soil dries out. And the cheapest solution of all: place ice cubes along the top of the soil. They’ll melt as the weather warms during the day and keep your potted plant going until you can get home after work! Install a water timer on your sprinkler, so you can keep the soil moist when you can’t be home. Buy a soaker hose (they are very inexpensive) and bury it alongside your most vulnerable plants. 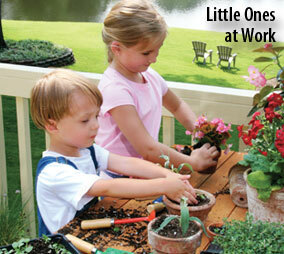 You’ll save tremendously on the water bill, and your plants will stay watered and growing their best. Attach Aqua Spikes to empty 2-liter soda bottles and fill with water. Sink the spike into the soil beside your thirstiest plants, and the water will gradually seep into the ground. This works for large containers as well. Of course, this time of year your weather problems may involve late frosts and icy spring temperatures. Again, you are not alone – and gardeners have developed a host of solutions to make sure those first tomato plants keep growing their best! Frost protectors range from simple air- and light-admitting row covers to plastic teepees that surround the entire plant to raise the temperature by several degrees. If you need to transplant before the weather has fully warmed up – or if you just live in a short-summer climate where every week of growing time really matters – you might want to invest in a Haxnicks Tunnel. This all-in-one row cover from England really can extend your season by up to 6 weeks in spring and fall. Other weather issues include excessive rain that washes out seeds and keeps the soil soggy. For this, raised beds are the only permanent remedy. If strong winds are the problem, consider growing a natural windbreak with fast-growing evergreens such as Thuja. But if your garden is too sunny or too shady, the best response is to go with the flow. Discover sun- and shade-lovers that do well in your climate and, as the old folks always said, make a virtue of necessity! Chances are you will be surprised by the new varieties you discover (and love!) along the way. Tempted by Dahlia blooms this season? We are too, and so we thought we’d offer a quick refresher about the best way to grow these glorious cut-flowers! This season we have Dahlias available from seed, tuber, and seedling. If you choose to start your Dahlias from seed – very economical and easy! 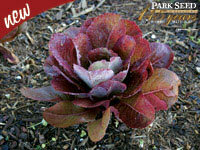 – be sure to dig the plants up carefully before first frost. You will find that your seed has grown a tuber, which you can store in vermiculite or clean cat litter indoors in winter, then plant out next spring! 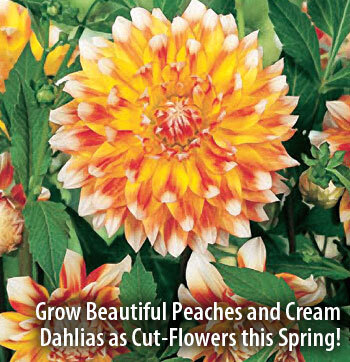 If you purchase Dahlia tubers, the growing is even quicker and easier! And if you select seedlings, they too will obediently grow a tuber. Whichever form you choose, you’ll want to select a good location for growing your Dahlias. The best place is in very rich, well-drained soil receiving full sunshine to light afternoon shade. Dahlias are heavy feeders – think Hollyhocks and Hardy Garden Phlox! – and you will want to make sure the soil is replenished with a balanced fertilizer throughout the growing season. Once the plants are budding, switch to a high phosphorus solution such as 10-30-20. Don’t stop feeding until the cold weather of autumn arrives and it’s time to dig up the tuber. Dahlias set big, heavy blooms, so the plants nearly always benefit from staking. Our favorite type is the round hoop-style supports, but anything you have on hand (even short bamboo stakes) will work. If using the hoops, set them right over the young plant as soon as it’s a few inches high. That way the branches can grow naturally up and through the hoops for better support without tying. Dahlias like a good deep watering every few days, and need to be checked for damage from slugs and snails, which adore the leaves. Some gardeners actually remove the lowest leaves of the plants, once the season is well underway, to prevent the problem. 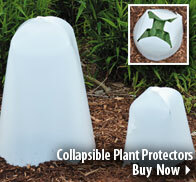 The same kind of protection you use around your Hostas works just fine for keeping slugs away from the Dahlias, too. If you would like a bushier Dahlia plant with more (but smaller) flowers, pinch the central stem several times during the growing season. This will encourage side-shoots to grow. On the other hand, if you would rather have a few prize-winning dinner-size beauties than a bunch of smaller blooms, remove all but the biggest bud on each flowering stem. Most importantly, cut your Dahlia blooms as soon as they begin to open and bring them inside for placement in spectacular bouquets! 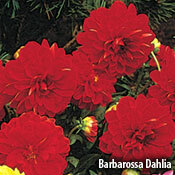 Dahlias are among the very finest of cut-flowers, radiantly colorful and quite long-lasting. 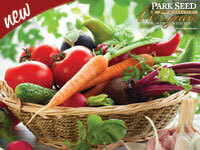 Enjoy one of Nature’s finest creations, right from your garden!